Distracted goalkeeper in under-8s match between Llanilar and Bow Street. 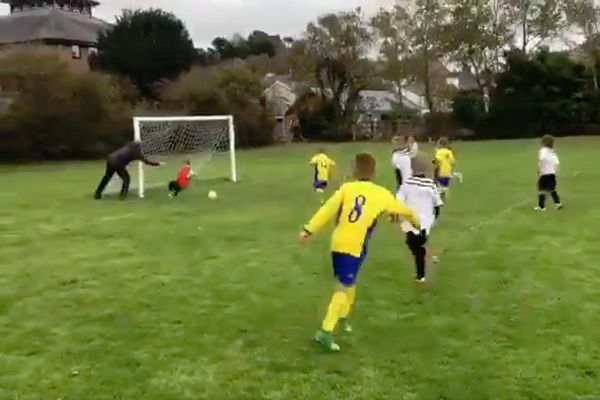 A clip of a goalkeeper in an under-8s match being pushed by his father in the direction of a shot has gone viral. Welsh sides Bow Street Magpies and Llanilar faced each other in an organised children’s game on Saturday. As Llanilar attack in yellow, the Bow Street goalie appears unaware of what’s happening on the pitch as he hangs out near one of the goalposts. The man, said to be the youngster’s parent by Chris Wilkins who first shared the video, is in close proximity. When Dad notices one of the players attempting to shoot, he pushes his kid, who falls in front of the ball and actually manages to stop the initial shot – despite presumably knowing little about it. However it is all to no avail as someone knocks in the rebound. The video has already racked up over 3.5m views on Twitter alone.